Shared virtual environments are often fantasy spaces where people interact using avatars endowed with supernatural powers. In contrast, simulations of large, real places are usually dedicated to traffic flows or disasters and involve independent software agents rather than avatars controlled by humans. A researcher at Kyoto University in Japan has combined the two ideas to make a virtual environment that allows large numbers of people and software agents to interact in a space that closely models a real place. The software, dubbed FreeWalk, allows programmers to model virtual environments or real spaces and supports large groups of avatars and agents. The work taps social psychological methods, multi-agent simulations and multi-user environments, said Hideyuki Nakanishi, a research associate at Kyoto University. Developers writing applications for FreeWalk can construct realistic spaces by mapping photographs of a real space onto the surfaces of a three-dimensional model of that space. Nakanishi has modeled a shopping district in Kyoto, complete with street and subway signs and store window displays. Avatars and software agents appear as humans, and both human users and agents use social cues like lip movement and gestures to inform their interactions with each other. Agents respond to the social cues of human users in order to mediate conversations and participate in group behavior, said Nakanishi. People tend to respond to spaces and people on computer screens as they respond to real spaces and people, said Nakanishi. FreeWalk takes advantage of this tendency by making the virtual environment believable enough that people behave appropriately for the context. Nakanishi has built a demo system for conducting virtual, or telecommute, evacuation drills. The system mimics disaster situations that include real social interactions, and can eliminate the cost and disruption of physically moving large numbers of people, said Nakanishi. The system uses speech recognition software to convert a user's words to text, and speech synthesis software to produce vocalizations for agents and avatars. Keyword matching provides agents with a rudimentary form of language understanding. The speech recognition and speech synthesis engines run on the user's computer, which minimizes the amount of data transmitted between users. The server running the simulation communicates with client systems only to add and delete avatars and agents. Voice, posture and gesture cues are transmitted directly between clients in a peer-to-peer configuration. Agents and avatars are programmed with basic behaviors like walking and avoiding collisions with each other, allowing programmers to concentrate on high-level behavior, according to Nakanishi. FreeWalk is in its third iteration. The original program, developed in 1996, was a spatial videoconferencing system. The second iteration added software agents that facilitated conversations between people by asking questions when the conversation faltered. The current version of FreeWalk adds a simulated place that provides a context for group behavior with agents as extras in the scene. Nakanishi's next step is to add details like fire and smoke. "I am aiming for the complete simulation of our living space," he said. To make the simulations more realistic and accurate, real-world human behaviors must be recorded, analyzed and modeled, said Nakanishi. Practical applications that use the simulation are possible in five to ten years, he said. The work appeared in the April, 2004 issue of the International Journal of Human-Computer Studies. The research was funded by the Japan Science and Technology Agency (JST). FreeWalk is open source software available at www.lab7.kuis.kyoto-u.ac.jp/freewalk. 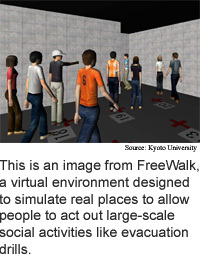 Related Elements: Technical paper, "FreeWalk: a Social Interaction Platform for Group Behavior in a Virtual Space," International Journal of Human-Computer Studies, April, 2004.